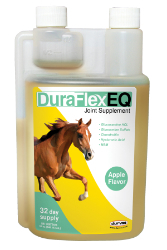 For use in horses and contains easily absorbed ingredients that help support healthy connective tissue, joint structure, and maintain normal joint function and mobility. Complete joint care formula. Great for aging horses with arthritis or joint problems. Apple flavor that horses love. Easy for horses to digest and utilize. Provide two ounces per day for first 10 days, then one ounce per day for maintenance. Both forms of Glucosamine Glucosamine HCL and Glucosamine Sulfate, Chondroitin Sulfate, Hyaluronic Acid, and MSM.